Was kann ich über die NEO tropical spanish class? I loved it!! Ich nahm in Santa Marta Privatstunden mit der wundervollen Elsa! Es hieß für mich, zwei Wochen intensiv spanisch paucken. Ich hatte schon einige Vorkenntnisse, da ich ein Jahr durch Südamerika unterwegs war, jedoch fiel es mir immer noch etwas schwer die richtige Zeit zu verwenden und genau zu wissen wieso. Des weiteren war ich mir auch in einer Konversation ein wenig unsicher! Elsa holte mich genau da ab, wo ich stand und hat mit ihrer tollen Art und den vielen verschiedenen Übungen die Zeit kurzweilig aber auch sehr lustig gestaltet! Ich habe sehr viel gelernt in den zwei Wochen und bin super dankbar so eine tolle Lehrerin gehabt zu haben! Wenn ihr nach einem tollen Spanisch Kurs sucht, bei dem individuell auf euch eingegangen wird und ihr auch nicht davor zurückschreckt intensiv zu arbeiten, seit ihr bei der NEO tropical school total richtig. Danke Elsa für die tolle Zeit! My partner Lucy and I had the pleasure to study with Aleja for the whole of 6 weeks and enjoyed the time very much. We were total beginners, but with studying for 3-4 hours a day, we really felt ourselves improving fast. Aleja was fantastic in keeping us motivated by keeping the classes challenging while providing help whenever we needed it. As we were heading of on a bike trip through Colombia, she made sure to include useful phrases, regional recommendations and advice on local cuisine. We couldn’t have asked for more. We even made patacones on our last evening – a really great experience. Fully recommended for everyone who wants to learn Spanish professionally in a great and friendly environment. I took private lessons with Aleja for over 6 weeks. She is an incredible teacher – patient, knowledgeable, and a great communicator. My Spanish abilities have improved by leaps and bounds, and she has given me the confidence to get out there and converse! Aleja’s classes are varied and always fun – conversation, reading, grammar, learning about Colombian history and music, and she was happy to focus on what I wanted to learn. I wouldn’t hesitate to recommend Aleja to anyone hoping to learn or improve their Spanish. J’ai pris des leçons privées avec Aleja pendant plus de 6 semaines. Elle est une enseignante incroyable – patiente, bien informée et une excellente communicatrice. Mes compétences en espagnol se sont améliorées à pas de géant, et elle m’a donné la confiance nécessaire pour aller de l’avant et converser! Les cours d’Aleja sont variés et toujours intéressants – conversation, lecture, grammaire, un peu d’apprentissage sur l’histoire et la musique colombienne, et elle était heureuse d’enseigner sur ce que je voulais apprendre. Je n’hésiterais pas à recommander Aleja à tous ceux qui veulent apprendre ou améliorer leur espagnol. Je vous recommande de prendre des cours d’espagnol avec Elsa ou Alexandra si vous vous posez à Santa Marta. Grâce à Elsa, sa méthode d’enseignement et tous les matériaux qu’elle avait pour m’enseigner la grammaire ou me faire pratiquer, j’ai pu améliorer mon niveau très rapidement. C’est l’idéal d’être en cours privé, le lieu des cours est magnifique et les prix très intéressants. Merci encore Elsa!! J’ai fait 3semaines d’espagnol avec Elsa. Mon objectif après ces 3 semaines était de pouvoir communiquer. Grâce à ces cours de haute qualité, j’ai facilement réussi mon objectif. Si vous désirez prendre des cours d’espagnol à Santa Marta, c’est à Neotropical qu’il faut aller. back in September as I was starting my trip to South America, I decided to take Spanish classes while in Santa Marta. the place is perfect to have classes as there is not that much to do during the day so you can focus on studying. I had classes with Aleja for 5 days and 4 hrs per day. Aleja’s approach was great, she adopted the teaching to my needs and we covered key vocabulary and grammar required for travelling. I did not speak any Spanish when I started but by the end of the week I felt quite confident to have small talk with people. we used cards for both vocabulary and grammar that I still use as a reference. And the house has a fan and you will be offered water and coffee (if you need to cool down or wake up I would highly recommend Aleja if you want to learn some Spanish. I wish I could have stayed for a week longer, I would be fluent !! thank you Aleja!! I started searching in the Internet for a teacher and found those two awesome ladies. and gave me amazing coffee with fresh fruits every morning, a wonderful experience. we spoke Spanish from the beginning. (because I wanted to and she also highly recommends it). but also gave me a good base how to study and how to continue studying by myself. I also have to mention that the rest of her family are super cute her daughter and husband and of course the cutest dog ever. Anybody wanting to learn, polish up or get a clearer understanding of the “subjuntivo” form of Spanish I highly recommend these ladies.! I spent 6 months with them and at the end of my time it was tough to say goodbye as we all became good friends over the time. Even if your just passing through Santa Marta and would like a quick week I can’t express how awesome these ladies are.! I had almost 2 weeks of classes with Elsa. She is very patient and helped me to understand the basics of Spanish. I am now since a few weeks on the road and very happy with the lessons I’ve had! I am more comfortable while traveling and very keen to continue with Spanish. If have the chance I would have done 3 or 4 weeks with Elsa! Thanks you so much. I had the most amazing 4 weeks learning Spanish with Elsa! She was very patient, always answering my questions and always giving me the chance to repeat grammar if it was unclear. I really liked her teaching method with focusing on speaking a lot and repeating the most important gramatical rules. I felt very comfortable, welcomed and had so much fun every day! She was very open too, e.g. she helped learn my favorite Spanish song. I highly recommend her classes! Thank you so much! ¡Tuve las 4 semanas más increíbles aprendiendo español con Elsa! Ella fue muy paciente, siempre respondía mis preguntas y siempre me daba la oportunidad de repetir la gramática si no estaba claro. Realmente me gustó su método de enseñanza, centrándose en hablar mucho y repetir las reglas gramaticales más importantes. ¡Me sentí muy cómodo, bienvenido y me divertí tanto todos los días! Ella también era muy abierta, por ejemplo ella me ayudó a aprender mi canción favorita en español. ¡Recomiendo sus clases! ¡Muchas gracias por todo! After a bad experience with Spanish lessons in Cuba I wanted to give it another try in Colombia. I found the website of Neotropical and send them an email on the 1st of January. They replied really quickly even though it was the first day of the year. The first week I had 4×4 hour lessons with Aleja and I got so enthusiastic that we booked another week in Santa Marta to take more lessons. My boyfriend started the 2nd week as well. The 2nd week I had lessons with Elsa. Aleja and Elsa are both wonderful! Really patient and professional, they work with really nice handouts. A perfect mix between vocabulary and grammar. Always happy to welcome you with hot coffee, fresh fruits and fresh water. I learned so much in these two weeks! I’m more confident to speak Spanish now during my traveling through South America. I would highly recommend them! I just returned from Santa Marta where I spent the last month working with Elsa for 4 hours per day on my Spanish. I can tell you that Elsa is a great teacher and a fantastic person. I can’t imagine a better overall experience. I worked with Elsa last year as well and returned to Santa Marta instead of exploring another city in Colombia or South America because I specifically wanted to work with Elsa again. She is an excellent teacher and Elsa and her daughter Aleja really make you feel at home when you are studying at there school. Thanks so much for everything Elsa and Aleja. Neotropical in Santa Marta for a Spanish course tailored to your individual needs! I spent two weeks with Elsa and Aleja, taking Spanish classes at intermediate level. We spent three hours together daily, and during this time we split our time between grammar explanations and exercises (tiempos pasados, subjuntivo, condicional, etc. ), reading articles on various topics, and discussing everything from everyday challenges that you encounter in a new country to political reform in Colombia. Both Elsa and Aleja taught me so much, not only about the Spanish language, but also about Colombian culture and society. The teachers were also very helpful when it came to recommendations about what to do and see in the region, and were eager to help me plan my travels. Every day they offered me freshly brewed coffee and fresh fruit to keep my blood sugar up in the hot weather, and they easily adopted the pace and content of the classes to my needs. Every day I got homework to finish up for the next day, but could easily decide for myself how much I had time and energy for. I can only give this language school my very best recommendations. Hope to see you again! I had two four hour lessons with Aleja and learnt so much! She was very patient, explained things very clearly and gave me much more confidence with conversational Spanish. The worksheets she gave me really helped me to practice the things we had been through in the lessons. If I had been in Santa Marta longer I would have definitely had more lessons with her. I definitely recommend Neotropical! Muchas gracias Aleja! I took one on one Spanish classes with Elsa twice a week for a month while I was in Santa Marta. I looked forward to class and was always greeted with a big welcoming smile and offered coffee which I never refused because it was so good! Elsa helped me revise the past tenses and subjunctive tense and also helped me with other questions I had. She gave me lots of exercises so that I could practice what we learned in class and we also had conversations to practice. Elsa is also very knowledgeable about the history of Colombia and the differences between the different departments so I learnt a lot about Colombia in our classes as well. I believe that my Spanish has improved since attending classes with Elsa. A very lovely person as well as a great teacher, I would highly recommend taking Spanish classes with Elsa. My experience taking Spanish classes at Neotropical was absolutely incredible. Elsa is an exceptional teacher. Imagine this: You speak your native tongue and you travel to a foreign land and your Spanish language teacher only speaks Spanish… It’s the best thing you could possibly do for your language learning! Your learning goes up a notch, you are immersed. There’s no better environment. Not to mention the bond and connection you will create in learning together, one-on-one, and trying to relate on all types of different levels. Elsa is a magical woman (and so is Aleja! ), with exceptional teaching skills, a beautiful soul, and she makes a mean jugo de mango. I’ve taken many Spanish lessons since and this by far was my greatest experience in that my language skills progressed faster, I felt at home, and I made a wonderful new friend. You will love it here! Aleja is wonderful. I came to Colombia with no Spanish at all and had 3 lessons a day for 4 weeks. Her approach with me was to try and ensure I could have everyday conversations with the people who you are most likely to meet in the streets, bars and restaurants. This was perfect for me. The first two weeks was concentrating on the present tense and I wasn’t bogged down by too much grammar. As my confidence grew she pushed me to do more and I ended up learning how to form …ING endings and how to form one of the simple past tenses [there are 4 apparently!] So after four weeks I feel I have come so far. Do people understand me in the street? Sometimes …! The difficulty of speaking in the street is that often people listen to what you actually say and not what you are trying to say. So one wrong syllable and it’s “no entiendo”. Having a good attitude and a smile goes a long way. Aleja and her team have a great approach and a lovely relaxed set-up in their home. Their house is very central and easily accessible. Whilst I was a complete beginner her students included, what sounded like experts to me, – expats who had been living in Colombia for two to three years who were trying to gain complete fluency and correct ‘fossilized’ mistakes. I wish her every success and would highly recommend Aleja and her team. I spent 2 weeks learning Spanish with Elsa and the classes were really great! Elsa helped me to revise and improve the Spanish I already knew, and helped me to build up my confidence when speaking Spanish. For me, the best way to learn is with complete immersion, so the classes were also very helpful as only Spanish is spoken within them. Elsa gave me lots of exercises to practise my grammar and we also practised conversational skills too. The classes were very well structured, clear and enjoyable. 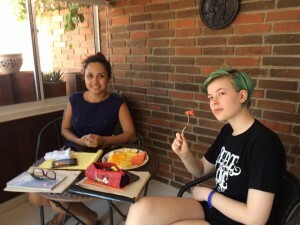 I highly recommend the Neotropical Spanish Classes! 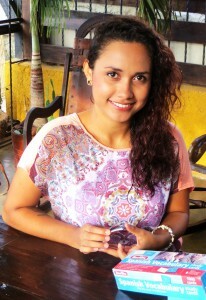 I study spanish with Aleja when I am in Santa Marta. Aleja is a very nice teacher. The class is very useful to me. After two weeks, I could write a letter in spanish. Thanks Aleja! Carolina and Aleja were extremely friendly and helpful. It was great taking one on one classes in such a nice environment (and with good coffee). Carolina was an awesome teacher. She made each lesson fun, and went out of her way to use different methods of teaching that suited me best. If I come back to Santa Marta I will definitely come back to pick up where we left off!! ¡Hola! I studied Spanish in Santa Marta for two weeks, four hours a day. Before the first class we discussed what I wanted to learn and get better at. I said speaking and having conversations in Spanish, so we mostly spoke during our classes, but also some reading and verb conjugations and other necessary things. I definitely think my Spanish improved, and quite a lot. Classes were great, midway through there was a break where we got amazing fruit. Santa Marta is also very beautiful with the sea and everyone is very nice and helpful even if you barely know any Spanish. I had a super great time and I would love to return some day to read more Spanish and maybe see more of Colombia. In januari 2017 had ik één week les van Aleja. Gewoon om mijn Spaans wat te verbeteren. Ik heb de lessen met erg veel plezier gevolgd. De kwaliteit van de lessen was uitstekend. Ik gaf aan welke onderdelen ik graag bij zou willen spijkeren en dat is zeker gelukt! De lessen vinden plaats op een rustige locatie tegen het oude en toeristische centrum aan. Aleja (en Elsa ongetwijfeld ook) is een ontzettend vrolijk, ontspannen, open minded en geïnteresseerd persoon die bovendien ook erg graag over haar land verteld. Ik heb hiermee ook veel geleerd over Colombia. Achteraf had ik veel langer les van haar willen hebben. I stayed in Santa Marta for one month and during that time I was taking daily classes with Aleja. My goal was to improve my intermediate Spanish skills and to become more fluent in the spoken language. I very enjoyed our meetings which combined the grammar (I have finally mastered subjuntivo), conversation, learning more about Colombian culture, discussions about different topics, writing exercises and of course homework. The school is located in the city center in a very nice neighbourhood and the atmosphere at school is very relaxed. Aleja also gave me lots of useful tips of places to visit in Santa Marta and the surrounding area and for further travelling in Colombia. Gracias por todos! When my boyfriend and I moved to Santa Marta 2 years ago we arrived with a little Spanish (him) and no Spanish (me). We started taking classes with Alejandra at Neotropical soon after arriving and it was the best decision we could have made. Alejandra has tailored the lessons each week to meet us at our individual levels. She is patient with our mistakes, pushes us to be our best and has given us the confidence to use Spanish in our daily lives. She makes something that is difficult, fun and enjoyable to do. It’s incredible how much you can learn when you have such an amazing teacher. We can’t recommend her enough! Taking classes with Neotropical Spanish school was one of the best decisions I made during my trip to Colombia. I was a beginner when it came to the language but today I am confident with my Spanish proficiency. I was a student at the Neotropical Spanish school from March 29 to June 25 in 2016. I had no proficiency in Spanish when I arrived but I was warmly welcomed to the school. I stayed in the offered apartments for the entire 3 months. I had classes every weekday morning for 3 hours. 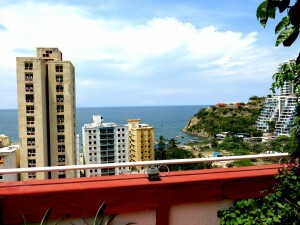 The apartment was a very convenient location for classes and also to enjoy the city of Santa Marta. Aleja and Elsa had a lot of resources and a very structured program of lessons. My classes with Aleja were very enjoyable. She would incorporate conversation, games and music into the class to make them more interesting. She was also very patient and this helped me improve my confidence in the speaking the language during class. Over the 3 months my language proficiency improved tremendously. By the time I left, I felt comfortable having a conversation with native Spanish speakers and also reading basic Spanish books. I highly recommend this school for people at all levels of Spanish proficiencies even beginners like myself. It was a great investment of my time and I would certainly do it again if I have the opportunity. I just finished 5 weeks of classes with Elsa at Casa Scania and I have to tell you that she is a great teacher and a great person. You won’t be disappointed if you take Spanish lessons with her. Elsa is a very experienced teacher and was able to ascertain my level after only talking for a bit and then came up with a plan to push my Spanish as far as possible in the time we had. It was exactly what I was looking for when I went to take lessons. We spoke in Spanish the whole time and my Spanish improved a lot in 5 weeks. Now that I am back in the U.S. I miss her lessons, but I also miss her. She is more than a teacher, she is also a very kind and generous host. I hope I get to see and work with again. I can’t recommend highly enough classes with Elsa and Alejandra. I did two weeks of private classes with Elsa (2-3 hours a day) and enjoyed every second. Elsa is a brilliant teacher, very patient and explains everything very clearly. She has some great techniques for helping you to learn. The classes felt very structured and Elsa knows exactly how to focus on areas you might need a bit more practice/help in, or noticing what knowledge you’re missing to help you move forward. I learnt so much in the two weeks – grammar and vocabulary. Elsa had a lot of great worksheets to work through in class and in your own time. I know this is going to continue helping me to learn even though I have finished the classes. Elsa teaches in Spanish but even if you don’t know any Spanish you shouldn’t let that put you off – it really helps to improve your Spanish! In addition, the surroundings you are taught in are incredibly relaxed. I really looked forward to going to class every day! I had nine or ten two hour lessons with Elsa over a period of around three weeks. I had been living in Santa Marta for a while with no previous knowledge of any Spanish and as such had been picking up bits and pieces but was lacking any real understanding of the language. Through these lessons not only did my vocabulary expand but I gained a good understanding of the foundations and building blocks of Spanish. We covered many verbs and how they function in the different tenses. Not only did my understanding improve dramatically but Elsa also introduced lots of helpful learning techniques. My main goal of the lessons was to take advantage of having a teacher there to explain how it all worked rather than just increase vocabulary and now having this understanding I can continue learning in my own time and when I return to England. Elsa was very helpful and patient and offered clear explanations of everything. The lessons are situated on a nice cool balcony in the pretty Centro Historico of Santa Marta with juice, coffee and water provided. Would thoroughly recommend the lessons if you’re looking to learn some Spanish while in Colombia. Elsa and Alejandra are just great!!! We did a course for 3 weeks what was the best thing we could do! When we arrived in colombia we couldnt speak any word in spanish but thanks to elsa we can now communicate with the people. The course took place in a beautiful atmosphere on elsas balcony (many(!) plants, coffee, tea or fruitjuice in the break). All these made the spanish learning totally comfortable. Elsas warming way of teaching helped us a lot and will help you aswell because she adapts the class to your speed of learning. In the first 1,5 week we learned the basic vocabulary and grammar which was very intensive, but the last 1,5 weeks we talked a lot about everything! Elsa is a woman with a lot of knowledge about colombia, so it is very interesting to talk to her.Furthermore we lived in the apartment of the spanish school which was more than we acpected! We absolutely recommend the spanish school to everyone!!! I took Spanish classes with Elsa in Santa Marta, for around three months in 2015. In short, she really is a great teacher; she has masses of really good material that she prints out for you to work on in class and at home, she is very clear and concise when explaining language and most importantly for me, eternally patient. The roof terrace where the classes are held is a lovely environment to learn, large fans keeping you cool, very important in Santa Marta, beautiful flowers and comfortable work benches, located on the quiet calle 21 away from the street noise. She also makes lovely coffee and has a cool Spanish speaking parrot you can practice with. Muchas gracias por todo Elsa. I took classes with Elsa 6 weeks, 2 hours a day! She works extremely hard to take you as far as you want to go with your Spanish. She has her own curriculum but she will also cover whatever you want to cover. For example, I wanted to know more finance Spanish so sometimes we would read Spanish finance articles together. Bottom line, she is a great teacher and truly cares about your development. If you want to learn more Spanish do yourself a favor and email her! Hola, I attended a one-week spanish-course at the Neotropical School in July 2015. And I can only recommend this school to everyone. The classes were fun and rich in variety, so it was a „easy“ way of learning, even though we went through a lot of topics. The friendly and open contact helps you losing your fears straight away and you can actually start learning. There is always time for questions, not only about spanish and grammar, but about colombian or south american culture, tradidtions, problems etc. So in a way the teachers manage to let you take part in organising the classes without losing sight of your aims. I really enjoyed my classes a lot, and improved my spanish at the same time. Luckily I also stayed at one of the school‘s apartments, which are just downstairs from where the courses are held. 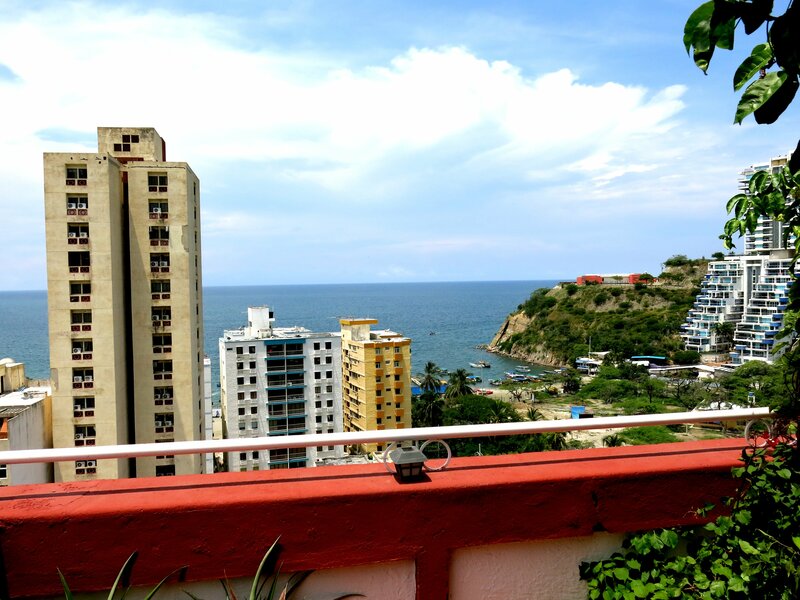 The apartment was clean and comfy, and because the school is situated in the historical center of Santa Marta, which is very safe and beautiful, you can also enjoy going out at night time and everything is located within walking distance. As I was alone as a girl, this was very important for me. And additionally to the great course and the super apartment, all teachers are really nice, they helped me with getting around, finding what I needed for my trip and just making me enjoy my time in Santa Marta. They really made me feel at home within days. J’ai eu le plaisir de passer deux semaines à apprendre espagnol avec Elsa a raison de 3h par jour. Non seulement la méthode utilisée était appropriée mais aussi Elsa a su adapter le travail en fonction de mes besoin en combinant les exercices de grammaire, la conversation et la lecture. De plus, les discussions avec Elsa m’ont permis de comprendre la réalité de la Colombie. J’ai aussi loge chez Elsa ces deux semaines et l’appartement était génial, avec tout équipement nécessaire et parfaitement place au cœur de Santa Marta. In July 2015, I took three weeks of classes with Elsa at Neotropical School in Santa Marta, Colombia. It was a wonderful experience and I left Santa Marta more confident in my Spanish abilities, more informed about the people of Colombia and having had fun in the process of learning. I highly recommend Neotropical and I would be delighted to provide further information if needed. Feel free to contact me at jnmacask@telus.net. My thanks to Leo. He was a great teacher and I really enjoyed the time I spent learning. I am struggling to keep going with the learning and he will tell me off if he knows I stopped practicing as much as I should! I would recommend him to anyone; he spent a lot of time making sure my accent was as good as possible as well as working on the constructions and vocabulary. I took Spanish lessons from Alejandra while I was visiting Santa Marta and I would highly recommend her classes. I did not speak much Spanish when I arrived and she gave me a good base and a solid understanding of the language, making it much easier to learn the language as I traveled. The classes were engaging and very beneficial, but they were also just a very enjoyable experience all together. The classes take place out on a covered patio, away from the heat of Santa Marta. We would drink coffee and juice during the lessons. It’s a very cozy and pleasant environment. If you are looking for Spanish lessons in Santa Marta or Rodadero, this is definitely the place to go. I had four weeks of lessons with Alejandra and she was a great teacher. Because of the way my head works, and because of the lack of English grammar that we are taught in school, I had many questions about the grammar that she was able to explain to me, which then meant I had some space in my head to actually learn some Spanish. I’ve taken a month of lessons in a school before, with a teacher who only spoke Spanish, and that didn’t work for me – I spent the month in tears because I didn’t understand anything. Ale allowed me to have a good mix of English questions and Spanish learning so I actually did learn something in my time there. She was very patient with me and was able to explain things in a way that I understood them. One on one learning was certainly the way to go for me to learn the basics – thanks again Ale, you are great! My fiancé and I have just recently finished studying spanish for the month of April 2015 with Elsa in Santa Marta and we can’t recommend her highly enough. After travelling South America for a few months and only knowing basic spanish words, after a month Elsa got us to a point where we were confident enough to be able to share stories and communicate in spanish and give us the confidence to continue our learning into the next six months of our trip. Elsa has a great personality and sense of humour and she makes you feel very comfortable in her classes straight away. We took our classes for 3 hours per day and she was very flexible with us as we preferred afternoon classes. The intensive learning really worked best with us as we jumped straight into the deep end, but Elsa was very patient and was able to answer any questions we had (which were a lot and in english). She was always prepared with notes and exercises and planned our classes really well and in a timely manner. Although Santa Marta is a very hot place, we took classes on Elsa’s verandah which was really nice and pleasant. Our time here went by too quickly and we found it very hard to leave. We also stayed in one of Elsa’s apartments in the old town of Santa Marta for the month whilst we were studying spanish. We fell in love with the apartment and felt at home straight away. The apartment consists of one bedroom, a fully equipped kitchen, bathroom and an area to relax and study. It is perfectly situated only 2 blocks from the supermarket and one block from restaurants and bars with the Marina an easy 5 min walk away. As Santa Marta is quite a hot place, Elsa provided us with more fans for our comfort, however at an extra charge you can use the air conditioner if you would like. Elsa also arranged a cleaner to come in and provide us with clean sheets, towels etc each week. The apartment is in a very quiet area and is perfect to relax and study and worked out perfect for us for the same cost as a dorm room each night. Spenderade 4 veckor hos Neotropical. Min spanska var vad man kan kalla obefintlig, det vill säga jag kunde i stort sett säga hola och räkna till tre. Hade läst lite om skolan innan jag åkte och om hur bra Elsa var. Dock är jag alltid lite skeptisk till recensioner på nätet då dom ibland inte överensstämmer med verkligheten, för att uttrycka mig milt. Men i detta fall kan jag verkligen gå i god för alla superlativ man kan läsa om skolan. Elsa är vad man nog kan kalla en genomgod, omtänksam människa. Lektionerna kändes väl planerade, det kändes både roligt och motiverande att gå till lektion varje dag. Lektionerna hålls uppe på Elsas i en fin och lugn miljö. Elsa kändes väl förberedd inför varje lektion och har ett enormt tålamod, något som är guld värt då jag absolut inte ser mig som något språkgeni, skulle kalla mig medelmåtta som bäst. Skall inte ljuga och säga att jag pratar spanska efter 4 veckor. Det gör jag verkligen inte, har dock fått en god grund och börjat förstå språket. Är dock ganska övertygad om att jag aldrig hade lärt mig mer någon annan stans tex i en större klass. Lägenheten jag bodde i ligger i samma byggnad som dar lektionerna hålls. Den hade allt jag behöver i form av kök, badrum och sovrum med air condition vilket kan vara guld värt med tanke på temperaturen i Santa Marta. Lägenheterna ligger i den historiska delen av Santa Marta, nära till en större livsmedelsaffär, restauranger och stranden. Så för att sammanfatta alltihop så är jag jättenöjd med min vistelse i Santa Marta hos Neotropical. Vill tacka Elsa, Alejandra, Sven, Leo. Underbara människor, kommer definitivt att åka tillbaka och försöka ta språket till nästa nivå. I’ve recently finished 2 months of one-to-one lessons with Elsa and also a few with Alejandra and I can highly recommend learning Spanish with these ladies. I took lessons for 3 hours each morning (Monday-Friday) and learned so much in that time. Elsa has the patience of a saint and is extremely encouraging. If ever I was feeling frustrated with myself, she would encourage and motivate me so that I had the confidence to continue. Alejandra used a creative approach to learning by sometimes using materials like songs and funny videos in her classes. In my lessons with Elsa, we used to chat about various things in Spanish for the first part of the lesson and this was always my favourite part of the class. Elsa is interesting, humorous and easy to talk to and it made speaking Spanish seem effortless. Also, her learning materials were plentiful and varied. If I didn’t understand something well, she would use another resource to try to demonstrate it in a different way. Elsa always came well prepared for our class and set good homework tasks. The one-to-one approach was the best option for me since we could move at my pace and tailor classes to my needs. I will be working in Latin America and so Elsa helped to keep classes relevant to the job I will be working in. A huge thanks to both Elsa and Alejandra for my new language! Als ich in Kolumbien ankam, wollte ich unbedingt meine kaum vorhandenen Spanischkenntnisse erweitern. In einem kurzen Vortreffen lernten ich Elsa kennen. Sie gab mir sofort Hausaufgaben und einen kleinen Ordner zum Durchlesen mit. Ich war ein bisschen aufgeregt, traute mich überhaupt nicht zu reden und verstand auch nicht grad viel. Jedoch war die ganze Aufregung umsonst!!! Ich freute mich täglich auf die Stunden mit Elsa, sogar so sehr, dass ich nach einer Woche beschloss, zwei Wochen länger zu bleiben. Jede Stunde fing mit Elasas Lächeln an der Tür an. Sie empfing mich an mit einem “come esta?”. Wir gingen in unser “Klassenzimmer”: ein schöner mit Pflanzen übersäter Balkon mit einem hauseigenen Papagei Jocke. Hier war eine schöne Lernatmosphäre garantiert. Die Unterrichtsstunden verliefen wie im Flug. Sie bestanden aus Grammatik, Hausaufgaben und ganz viel Konversation über die kolumbianische Kultur, über das Leben uvm. Nach 3 Tagen hatte ich das Gefühl mich mit einer Freundin zu treffen. Elsa ist eine kompetente Lehrerin und wunderbarer Person. Learning new languages has always been a personal weakness of mine, however my lessons with Alejandra have improved my confidence immensely and after two weeks under her tuition I was more than able to competently get by in Colombia with the Spanish I learned. I started working in Colombia earlier in the year without any prior knowledge of Spanish. Outside of my workplace I found it very difficult communicating with English, so it was essential to pick up the language quickly. The one to one tuition worked well for me as it meant the lessons could be tailored for my needs and we could spend more time on areas in which I required more practice without the worry of holding up other students. We could go at a pace I felt comfortable with and adapt lessons appropriately to experiences I was having both in and outside the classroom. Alejandra was incredibly patient throughout and the whole learning experience was most enjoyable. I don’t think I would have been able to advance as much as I did if it were not for this. 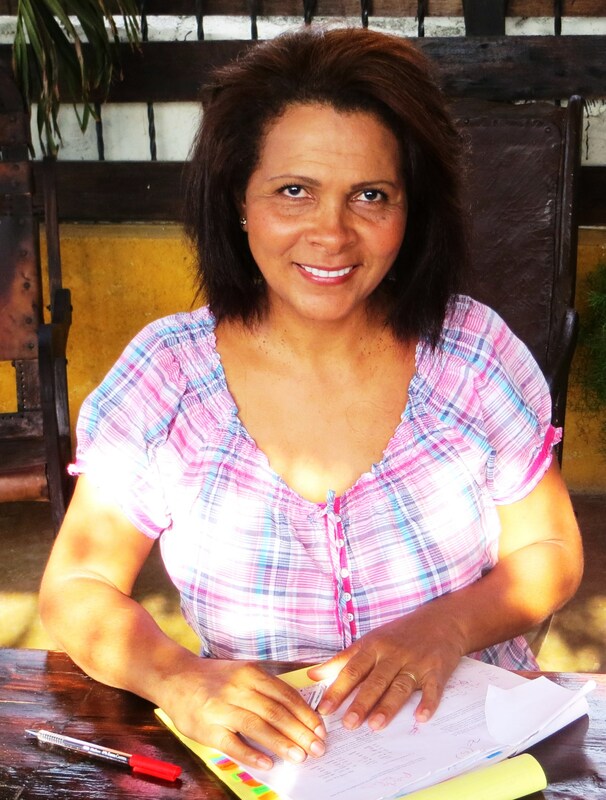 I arrived in Colombia enthusiastic to learn Spanish albeit somewhat daunted by the prospect and so I would recommend lessons with Alejandra for anyone in a similar position to myself. If she can get me speaking spanish in the short time we had together I’m sure she could do the same for anyone. Taking Spanish classes with Elsa absolutely stand out as a highlight of my trip to Colombia. When I arrived I had zero confidence and only basic knowledge of the language, but Elsa was always patient, well prepared, and super enjoyable to talk to. I left Colombia a few months later basically fluent in Spanish, and I credit Elsa’s classes with a large portion of this success. By selecting appropriate lessons on the different language structures, and varying pieces of media (news articles, song lyrics, etcetera) for us to read, she was incredibly skilled at tailoring each class to both my skill level and my personal interests. I could tell she loves connecting with her students, and that she had been doing it for many years. Not only was she a fabulous teacher, but she went out of her way to help me navigate the culture whenever I needed a hand from a local. Elsa became one of my favorite people I met during my months in Colombia, and I cannot recommend her classes more highly. Con Elsa imparare lo spagnolo è stato un gioco da ragazzi. La sua migliore capacità è quella di trovare il giusto equilibrio tra lavoro tecnico, letterario e di conversazione. Adattandosi alle preferenze degli studenti riesce quindi a far volare il tempo e a massimizzare il risultato, senza mai essere un peso. Inoltre grazie alla sua esperienza con studenti di svariati paesi sa individuare esattamente le difficoltà che uno straniero incontrerà nell’imparare la lingua; gli esercizi vengono da lei scelti proprio in base alle caratteristiche di ognuno. Nel mio caso Elsa ha preso in considerazione il mio livello di conoscenza basso, adottando una progressione veloce grazie all’italiano che aiuta grazie ai parallelismi. Ho avuto un insegnamento su misura che mi ha portato risultati rapidi, superando le mie aspettative. Ich hätte nicht gedacht dass spanisch lernen tatsächlich so entspannt sein kann. Elsa kann unheimlich gut die Lernfähigkeit des Schülers schätzen und wendet dementsprechend den optimalen Kompromiss zwischen Konversation, Lesen und Grammatik an. Die Unterrichtsstunden fliegen und es wird nie langweilig. Sie hat in den letzten Jahren Studenten aus vielen Ländern unterrichtet, und kennt daher die individuellen Schwierigkeiten jeder Fremdsprache, wenn es um das Lernen des spanischen geht. Sie wählt die Übungen um diese Schwächen entgegenzukommen. In meinem Fall haben wir mein Basisniveau mit meinen Kenntnissen aus italienisch und deutsch kombiniert; der maßgeschneiderte Unterricht hat unglaublich schnelle Resultate gezeigt, von denen ich sehr begeistert bin. Probably like many of her students, I found information about Elsa’s classes on internet. I stayed in Santa Marta for just a week, and wanted to improve my Spanish during that time. So, I agreed to take classes with Elsa every day of my stay. I loved that we spoke only Spanish, – it intimidated me at the beginning but of course helped feel more confident afterwards understanding and speaking with locals during my travel. I also loved how Elsa made me feel comfortable in her class but stayed demanding and corrected all my slips of the tongue. I really appreciated it as I prefer learn the correct way from the very beginning instead of having to re-learn later. 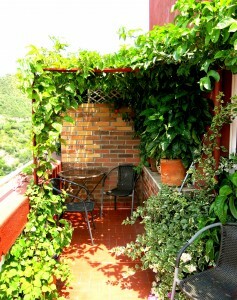 Finally, I loved the space where we had the classes, – a terrace with lots of plants and light! Its already been months ago, but up untill today I still have to think about all the things I learned in the lessons with Elsa in Santa Marta! I didn’t speak one word of spanish when I arrived in Santa Marta and traveling for 4 months in South America speaking spanish is quite a must. I told Elsa I wanted all there is to learn in spanish in 1 week and we would see how it goes. And I did get a bookwork of papers, we made long hours, and we spoke directly in to Spanish. But was that bad? No, just the contrary! This is the way of learning, especially when she makes every lesson fresh coffee, sipping it on her terrace while learning and practicing spanish. Elsa is really patience, will always be helping you without getting anoid and she will be more than happy to teach you spanish and make a program for you. Now, after 3,5 months and still traveling, I can speak fairly good spanish, understand almost everyhing in spanish and can have lots of different kinds of conversations! Of course, you have to practice, but your skills in spanish will develop and improve based on how you learn the basics in the beginning. Every single teacher has their own approche of teaching. I spoke to a few people how they had other ways of learning the basics in spanish, which eventually led them to having more struggles of improving their spanish. My husband, Bill and I have been trying to learn Spanish, intermittently, over the years, but without real success. However, after taking two weeks of spanish lessons with Elsa (3 hours each morning) we turned a corner in our understanding of the language, ability to formulate sentences, speak with confidence and ability to retain the language. She has given us confidence, that with continued study and practice, we can develop some fluency in spanish. This has also increased our motivation to be tenacious in our study of the language. It was challenging but we never felt pressure. Elsa understands the fears of a learner and makes language learning not about performance, but about the application of the language. Her approach took away our stress and lack of confidence. It was fun to learn on her leafy green patio and to practice and do homework in her lovely apartment that we rented while we studied. Elsa is warm, friendly and highly supportive. So is her husband Sven who popped in from time to time and this added to our understanding. We had fun, but more importantly, we actually improved our Spanish. I found Elsa on the internet and studied with her 10 hours per week. Elsa is a perfect teacher.She was very patient with me. So now I can travel and communicate with people. My Spanish is not perfect, but with the help from Elsa it´s much better. learning at three times the rate compared to the other schools I studied at. guys, I really appreciate your work. Hope to be back next year. 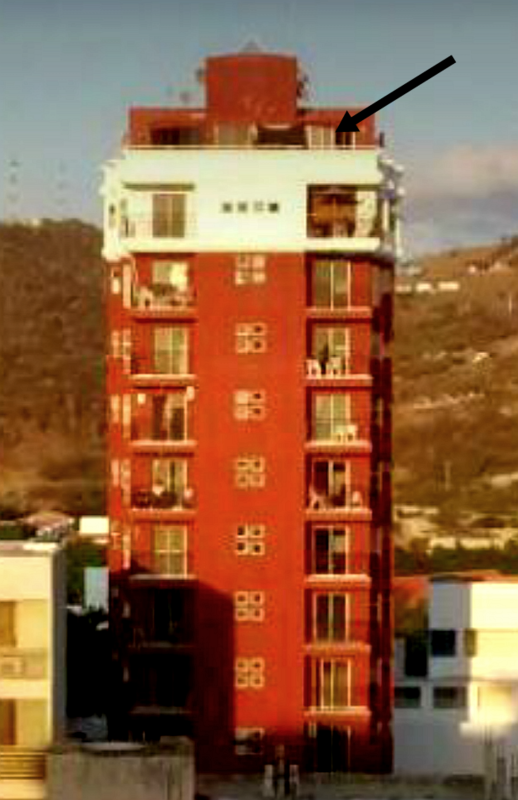 language school in a central location in downtown Santa Marta. They are attentive and systematic. All instruction is in Spanish, and when you are not clear about something, they explain it using other Spanish words, or by using pictures or gestures. They only translate as a last resort. They prepare materials for you, give you homework if you so desire, and follow through on previous instruction. They were very patient with my clumsy attempts to communicate, usually understood what I was trying to say, and modeled the correct Spanish for me. They are as flexible as they can be about class times and the duration of your course. Classes are pleasantly situated on their rooftop terrace where you are surrounded by plants and their tropical birds. I felt I learned a lot in a short time. molded around the student’s interests and needs, and a readiness to address any questions around usage, vocabulary and grammar. Thank you! recommendations. I felt that they created a program especially for me. Since I was only taking classes for one week, it was important that my needs were assessed quickly so that we did not waste a large amount of time. They were able to evaluate what I needed in less than one hour which allowed us to begin the process of improving my Spanish the first day of class.I have to say that the experience exceeded my expectations! wonderful time we had in Santa Marta. Alexandra thoroughly enjoyed her Spanish lessons with Elsa and she misses them! We both loved being immersed with the Colombians for the time of our visit as opposed to being on the “big tourist trail”as in many of our other foreign travels. The background information about the places Alexandra was going to visit prepared for her before every excursion was very helpful. Not only did she improve her conversation skills but she learned some very interesting information that tied into her excursions. Alexandra is starting driving lessons this week. She isn’t very happy about that and would much rather have Spanish lessons instead. I had fun studying at Neotropical. Elsa is friendly, open and a great teacher. Their location is beautiful and Santa Marta is the best!ir. Machiel Willemsen, mac.chiel@gmail.com. I took private classes with Elsa for about two months while I was in Santa Marta. We met a day before I started classes to clarify exactly what my learning objectives were, making the subsequent classes a lot more efficient. Elsa was able to teach me the basic framework of the Spanish language very naturally and I was able to converse with her after only a few weeks of classes. She was very flexible with the classes, focusing on topics that interested me and basic concepts that I needed to learn in order to speak the language on a day to day basis in a natural environment. I enjoyed the classes very much and never did feel as though I was in a classroom. say that the private classes with Elsa flattened my learning curve by a wide margin.